Lance Dreher arm workout, his gigantic arms came from a deliberate type of hard training. Ken Waller arm workout, Ken Waller was an old school bodybuilder who's training tactics gave him 19 inch arms. Johnny Fuller arm workout routine, johnny believed strongly is training with giant sets always pushing himself a bit farther than he did the time before. John McWilliams arms, learn about John McWilliams workout routine. John Grimek arm workout, Grimek did a wide range of training that included many exercises that have disappeared from the world of weightlifting. John Defendis workout routine, He never did anything less than 30 or 40 sets for his arms. Yet, it worked for him, he built 20 inche biceps. John Cena arm workout, He trains all the muscles of the arm at different angles, the two heads of the biceps and the three heads of the triceps, at a very high intensity. Joe Bucci arm workout, Joe Bucci used what he called The Piston Power Training System which involves working up to maximum weights in each exercise and increasing the speed of movement, while keeping in the grove and still using perfect form. Jimmy Snuka arm workout, At his biggest he had a 54-inch chest with impressive 21 inch arms. 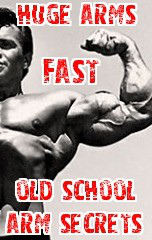 Jimmy Snuka is from the old school of bodybuilding where the goal was to get as strong as possible in the basic movements.